Many water distribution systems in South Africa are deteriorating due to many years of neglect, resulting in a serious maintenance backlog. Aiming to find a solution to this, one of the largest advanced pressure management projects in the world was undertaken, which successfully tackled water losses and improved network management. Ronnie McKenzie and Willem Wegelin discuss the project’s innovative public-private partnership approach. Emfuleni Local Municipality is located to the south of Johannesburg in the industrial heartland of South Africa. A separate water utility called Metsi-a-Lekoa was established several years ago to manage the supply of potable water to approximately 1.2 million residents of the municipality, 450,000 of which are located in the Sebokeng & Evaton areas. Water is supplied to Metsia-Lekoa from the local bulk water provider, which is one of the largest providers of potable bulk water in the world. The areas are predominantly low income residential areas with approximately 70,000 household connections, each of which is supplied with an individual water supply as well as a sewer connection. The combination of low income coupled with high unemployment has resulted in the general deterioration of the internal plumbing fittings over a period of many years, causing high levels of leakage. 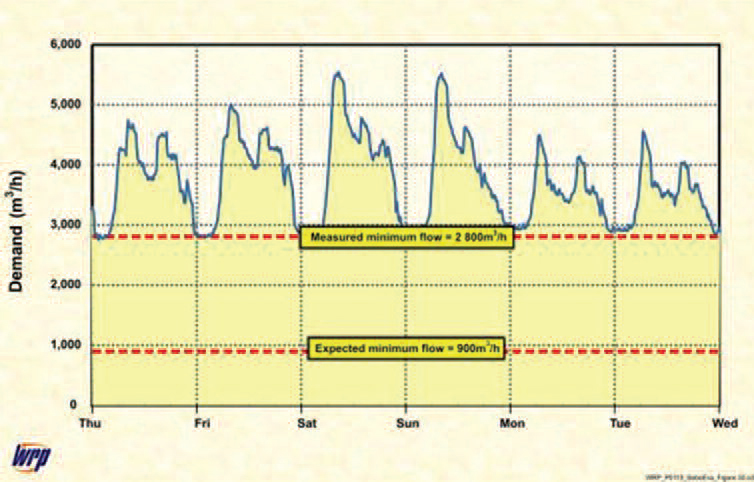 The leakage at the start of the project was known to be extremely high, as indicated by a minimum night flow (MNF) in the order of 2800m3/hr (see Figure 1). This was one of the highest MNFs recorded anywhere in the world and represents almost two Olympic-sized swimming pools of water every hour during a period when demand for water should be minimal. It should be noted that there is virtually no storage in the Sebokeng & Evaton areas, either at the bulk reticulation level or domestic property level. The high MNF is therefore almost completely due to leakage,most of which occurs inside the properties and is therefore not evident from normal visual inspection. It should also be noted that since most of the leakage occurs inside the households, the leaking water returns to the sewage treatment plant through the sewer network,which is often overloaded to such an extent that spillages of raw sewage into local river courses are a common occurrence in the area. It was estimated that the wastage in the area before the project was commissioned was in the order of 80% of the water supplied to the area,which in turn represented an annual water bill of approximately R120 million ($20 million) per year in 2003. In 2004, the municipality appointed WRP Pty Ltd to design and commission what is one of the largest advanced pressure management installations in the world, as the first phase of a long term strategy to reduce wastage in the area. The project involved no financial input from the municipality and even the initial capital costs were borne in total by the project team. The project was, effectively, a small-scale public-private partnership (PPP) involving a simple risk-reward model and the original concept is discussed in detail by Mckenzie and Wegelin (2005). It basically reduces water pressure in the area during off-peak periods and in this manner reduces the water lost through leakage. It should be noted that Pressure Management is only one of the many possible water demand management (WDM) interventions that can be considered when trying to reduce leakage and wastage from a water reticulation system. The leaks are not repaired and will continue to run, albeit at a much lower flow rate. After pressure management has been implemented, it is usually necessary to address the underlying problems using different techniques and in this regard the full range of WDM techniques should be considered. From the outside, the installation is unimpressive and similar to a large concrete box – 10m long by 10m wide and approximately 5m deep. Inside it contains the various pipes and valves required to manage the water pressures into Sebokeng & Evaton. 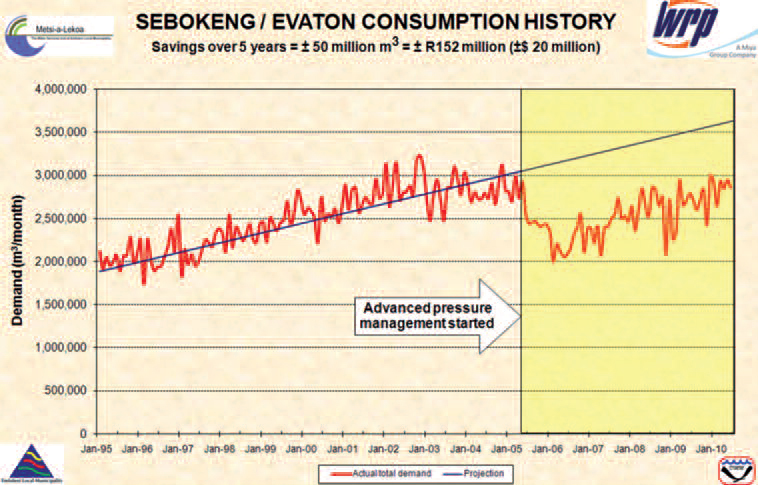 The Sebokeng & Evaton project is thought to be the largest project of its type in the world and the savings were so large that the installation had a pay-back period of less than two months – this is based only on the water charges,most of which are associated with the pumping costs since the water is pumped from almost 100km away through a head of approximately 200m. The construction was completed using labour-based practices in order to maximise the employment opportunities to the local communities. In addition, a series of more than 50 public meetings were presented in the local communities to inform the residents of the project and to address any concerns they had with regard to the project. Through the detailed public consultation process, the project was completed without any incidence of theft or intimidation of any nature and all residents were in full support of the project, which was a key factor in its success. The installation involved cutting into the two existing water mains and replacing a short section with a series of smaller pipes and associated valves, meters, strainers etc. The new pipework and fittings enable the pressures into the two areas to be controlled in such a manner that the water pressures can be reduced during off peak periods and restored to the original high pressures during periods of high demand. In this manner, the leakage from the system as well as the incidence of new burst pipes was greatly reduced. The project team involved 12 main role players in a sophisticated and complex PPP, in which the consultant took 100% of the risk associated with the capital funds required to build and operate the installation for five years. This necessitated obtaining loans from a commercial bank, which in turn involved provision of adequate security from several individuals in their personal capacity. The client is Metsi-a-Lekoa, which is the ring-fenced water utility formed by Emfuleni Local Municipality and was managed at the start of the project by CEO Mr Sam Shabalala. The funds required to complete the project were raised privately by WRP through Standard Bank. The establishment of the contract on which the project is based was funded and facilitated by the Municipal Infrastructure Investment Unit (MIIU) and Metsi-a-Lekoa. The consultant’s team comprised the Gauteng-based WRP Pty Ltd in association with DMM Development Consultants. Additional specialist support was provided by various other sub-consultants, including structural design by Platinum Consultants, and support on the conceptual design by Coplan. In addition Mr Tim Waldron, the CEO of Wide Bay Water in Australia, acted as a specialist reviewer. The main contractor for the project was WK Construction. The most obvious benefits from the project are clearly the savings in water purchases by the municipality from the bulk water provider due to the reduced leakage in the Sebokeng & Evaton areas. The initial projected savings of approximately R20 million ($3.3 million) per year (Mckenzie and Wegelin, 2005) were in fact exceeded and after the first full year of operation the actual savings achieved were closer to R30 million ($4.5 million) as highlighted by Mckenzie and Wegelin (2006). With the implementation of the advanced pressure management system the water demand was reduced to 1997 figures, as can be seen in Figure 2. The reduced water demand also had a significant impact on the sewer flows entering the treatment plant, which reduced from 2500m3/h (July 2003) to 1800m3/h (July 2005). As a result of the project the client has gained a reprieve of at least ten years on the upgrading of the water supply and sanitation infrastructure. The reduced pressures have also resulted in a significant reduction in the number of bursts experienced in the area, which in turn will prolong the life of the infrastructure. Under normal circumstances with large-scale pressure management projects, the system pressures are gradually reduced during the off-peak periods to ensure that some minimum level of service is achieved at the critical point in the system, which is the point experiencing the lowest pressure at the time. The critical point can usually be identified from the reticulation layout drawings or from a hydraulic model of the system if such a model is readily available. The critical point is then monitored continuously as the pressure management activities commence. In the case of the Sebokeng & Evaton project, the above process did not proceed to plan and numerous communities complained of low water pressures in areas that theoretically should have had no problems. On closer examination of the unexpected problem areas, it was found that many of the problems were caused by poor maintenance or inappropriate operation of various boundary valves and / or control valves. In many cases, the boundary valves were left in a semi-open position due to the fact that the operations staff did not know if they should be open or closed. The operations staff also had the habit of closing sections of pipe in cases where a burst had occurred instead of repairing the burst and reopening the pipeline. This has caused serious bottlenecks in the system, which only became apparent when the pressures were lowered. In each case the project team had to cease all further pressure reduction activities and undertake a full investigation involving significant field work to identify and correct all problem valves and / or sections of pipeline in a particular area. Following the corrective measures, it was normally found that the overall level of service to the specific community improved significantly when the system was reinstated to its original configuration. In addition to the identification of bottlenecks as discussed previously, there were numerous cases where serious problems were found in the basic reticulation infrastructure. One of the most common problems identified was that of ‘missing’ pipes or connections. In several cases it was found that connections from smaller pipes (200mm or less) had not been made to the bulk mains running through a particular area. In one case, it was found that of the four connections shown on the ‘as-built’ plans, only one had in fact been commissioned. The remaining three connections were sealed with a blank flange plate just before the connection point. In this instance, the community of approximately 3000 residents had been experiencing intermittent supply (water available only during the nighttime periods) for almost nine years and had stopped complaining many years ago since nothing was ever done to alleviate the problem. On excavating the three mystery connections and adding the necessary T-pieces, the area was restored to full system pressure on a 24-hour basis for the first time. Although the additional connections actually increased the water use in the one problem area, it allowed the pressure to the whole of Sebokeng & Evaton to be lowered during the offpeak periods, which more than made up for any small local increase in use during the remaining periods. The other key problem identified with the infrastructure was the identification of ‘missing’ valves which were not shown on any reticulation drawings but were thought to exist by the project team due to the manner in which the system was responding to the water pressure. In one case, a valve chamber had been buried with rubble and rubbish for approximately 30 years and when the valve was eventually unearthed, it had seized completely. In many cases, the valves are more than 60 years old and must be removed completely and refurbished in order to restore the reticulation system to its normal operating condition. This type of problem has been a common occurrence and it is anticipated that more than 100 large valves will have to be refurbished. Prior to the implementation of the project, the municipality was unable to access any funding for WDM activities of any nature and even the various ‘development’ banks were unwilling to provide funding for the project. Once the project had been completed, however, and the results were published, the situation changed dramatically and suddenly there were several organisations (including the bulk water provider) wishing to invest funding in the Sebokeng & Evaton area. One of the main supporters of the project is now the Department of Water Affairs and Forestry (DWAF) which is the national custodian of all raw water in South Africa and also fulfills the role of regulator countrywide. After assessing the savings from the Sebokeng & Evaton pressure management initiatives, DWAF realised the value of such projects and created a new budget to help overcome the funding difficulties that originally threatened to halt the project. Approximately R50 million ($8 million) was allocated for WDM activities in 2007. Of this, more than R10 million ($1.7 million) was used to support WDM activities in Sebokeng and the surrounding areas. In addition to the injection of DWAF funding, the municipality was able to use some of the surplus funds from the water savings to improve the reticulation network in the area. Approximately R10 million ($1.7 million) from the savings was returned to the water utility to match the DWAF funding in 2007. Prior to the project, the municipality had virtually no budget for maintenance of the system since all funds were being used to support the water account from the bulk supplier. Prior to the project, the only publicity received by the municipality was usually with regard to spills of untreated sewage in the Vaal River. Such spills were due in part to the poor infrastructure of the multiple sewage pumping stations and in part to the huge sewage inflows, which in turn were caused to a large extent by high internal household leakage. Since the project has been initiated, it has created significant positive publicity for the municipality and has picked up no fewer than four national awards for technical engineering excellence. The publicity surrounding the project has created awareness at the highest levels in government and the project has been acknowledged in Parliament by the Water Portfolio Committee as a model that should be repeated throughout South Africa wherever conditions permit. Development of an asset register as first step to full asset management system. One of the key problems facing many WDM interventions is maintaining the initial savings after the project has been completed and the project team has been paid for its efforts. In the case of the Sebokeng & Evaton PPP, the project team was responsible for all maintenance and operation for the full five-year period. The project team received payment in accordance with the savings generated (up to an agreed limit, after which 100% returns to the municipality). It was therefore essential that the project continued to operate properly for the full five year project period or the financial implications for the project team would have been serious. This is one of relatively few WDM projects where the savings were audited carefully on a continuous basis and this was one of the key elements to its success. While the Sebokeng & Evaton PPP is clearly one of the most successful small-scale PPPs to be completed in South Africa, the real benefits of the project are only now materialising several years after the project was commissioned. As a result of the significant savings in water purchases from the bulk water provider, the municipality has been able to allocate additional funds for maintenance of the water distribution system. Due to the availability of the additional funding, many new initiatives have also been implemented in the area that could not have been considered before the PPP had been commissioned. Some of the other initiatives are discussed in the paper by Siqalaba (2006), which highlights many of the softer issues such as community awareness and school education, which have been addressed over the past five years. It is clear that such issues are extremely important and that without proper consultation with the community even the best planned technical interventions will fail. It is clear that although the financial savings generated exceed all initial expectations, the hidden and often less tangible benefits greatly outweigh the obvious and tangible benefits. Lawless, A (2008) Civil Engineering – the critical profession for service delivery.Civil Engineering,Volume 16,Number 1, p26-29. Mckenzie, RS, Wegelin, W, Mohajane, P, and Shabalala, S (2007) Hidden benefits of small scale performance based Public Private Partnerships. Proceedings from the International Water Association Specialist Conference: Leakage 2007, Bucharest, Romania, September 2007. Mckenzie, RS and Wegelin, W (2006) Small-scale South African PPP delivers pressure management success. Water21, magazine of the IWA, December 2006, pp 20-23. Mckenzie, RS and Wegelin, W(2005) Sebokeng/Evaton Pressure Leakage Reduction: Public Private Partnership. Proceedings from the International Water Association Specialist Conference: Leakage 2005, Halifax, Nova Scotia, Canada. pp 382-391.12 - 14 September 2005. Mckenzie, R (2005) Pressure Management: Overview of Activities in South Africa. Paper presented at the International Water Association Specialist Workshop, Radisson Resort, Gold Coast, Queensland Australia. 24 February 2005. Mckenzie, R,Mostert, H and De Jager, T (2004) Leakage Reduction Through Pressure Management in Khayelitsha: 2 Years Down the Line. Paper presented at the 2004 Biennial Water Institute of South Africa Conference, ICC, CapeTown, 3-5 May 2004. McKenzie, R, Mostert, H and Wegelin, W (2003) Leakage Reduction through Pressure Management in Khayelitsha, Western Cape: SouthAfrica. Paper presented at the Australian Water Association Annual Conference, Perth, 7- 10 April, 2003. McKenzie, R (2002) Khayelitsha: Leakage Reduction through Advanced Pressure Control. Journal of the Institution of Municipal Engineering of South Africa,Volume 27, No 8, pp43-47. McKenzie, R (2001) Development of a pragmatic approach to evaluate the potential savings from pressure management in potable was distributions in South Africa: PRESMAC. Report TT152/01 published by the South African Water Research Commission, July 2001. ISBN No.1 86845 722 2. Siqalaba, Z, Mckenzie, RS, and Kekana, C (2006) Reducing Water Wastage in Sebokeng. Paper presented at the IMESA Annual Conference, Soweto, 11-13 October 2006. Wegelin, W and McKenzie, R (2002) Leakage Reduction through Pressure Management: Concepts and Case Studies. Report TT 186/02 published by the South African Water Research Commission, August 2002. ISBN No.1 86845 832 6.